When it comes to Indian buffets, Feast India Leicester, according to my experience, is the best restaurant. I was there on 27th January 2012 for my sister in Law's Degree congregation. I didn't expect it to be so good! It is quite big with loads and loads of options to eat. As far as I remember I saw and/or had the following dishes: Paani puri, chaat, masala dosa with green and white chutney, idly, sambar, podi (spicy south Indian powder) with oil, chicken tandoori pieces, green chicken kababs, lamb kababs, onion bhajis, prawn crackers, chinese manchurian, chinese noodles, chinese fried rice, chicken biryani, prawns biryani, lamb biryani, fish pakoras, fish curry, minced lamb curry, lamb rogan josh, chicken curry, baingan masala, daal, gulab jamun, barfi, jelly, gajar ka halwa, jems, different flaours of ice creams, desserts, green veg paties, chilli paneer, chilli chicken, spicy potatoes, medhu vada / udid vada, plain rice, Indian breads and much much more. I don't remember the names of all the dishes. But it is a "must go" place. There is a bar as well. But no drinks are included in the Buffet. It is a big place compared to the restaurants in London. It reminded me of the big restaurants in India. Indian restaurants can be really huge. It was a Friday night and the place was quite crowded. One negative point that I noticed about the restaurant was that though we booked a table beforehand, it took us about 25 minutes to get a table after our arrival at the restaurant. It might be due to the popularity of the restaurant and the fact that it was a Friday night. It could also be due to the fact that we were 10 of us and it would have been a bit of hassle to get big vacant table. The buffet zone was separate from the normal dining zone. The price per place was £15.95. The staff was quite friendly and prompt. Every time you finish the contents of your plate, you could get a new plate and the waiter would take away the used one. You can have as many refills as you wish. The restaurant seemed to have been themed around the golden olden days of India. There were many posters of Old Hindi movies, old pictures of Mumbai local trains, local people, Structures built by the British in India. 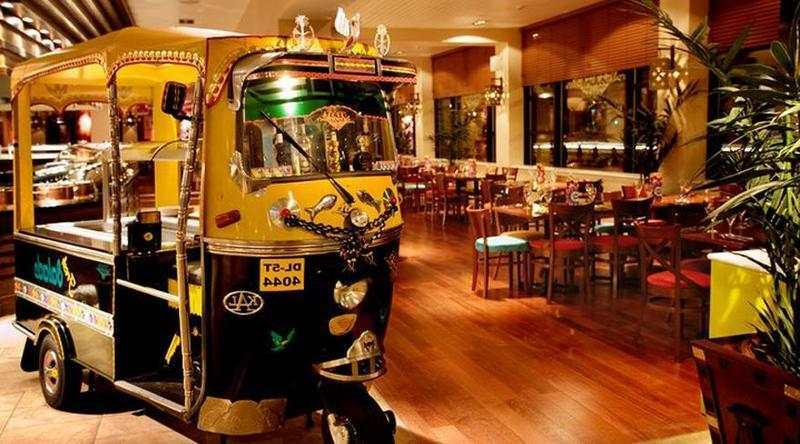 Oh, and there is an Auto Rickshaw at the reception ! There was a separate section of Old Indian cricket pictures and information near the bar. There was a separate zone for people waiting for a table. It was quite interesting to see the costs of old cricket equipment in India. As far as I remember, a cork ball costed Rs 15 which is around 20 pence. A good bat costed around Rs.50 to Rs.100 which is around 1 pound ! The place was quite buzzing and lit with dim lights. I would definitely recommend it to every one. In fact just a couple of days ago I wrote on my sister in Law's Facebook wall "I am missing Feast India a lot, could you please request the owner to open a branch in London :)"
Comment: Our friends visited your restaurant Saturday and throughly enjoyed the evening. Please let us know if you happen to open the similar restaurant in London or surrounding area. We can annonce in our carers meeting. We are always looking similar place to eat and enjoy.